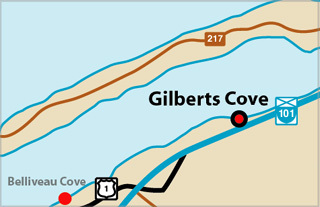 For visitor's information, go to Gilberts Cove Lighthouse . This is a square keeper's house painted white with the lighthouse lantern atop the roof. Whereas most lighthouse keepers lived separately from the light itself, the lighthouse keeper and family lived in this lighthouse for over 50 years. It is perched upon a small point of land 15 feet above high water level. The lighthouse is one of only three of this type left in Nova Scotia. The light tower with its cat walk, 29 feet above the base of the solidly built house, has inside steep-stair accessibility. Painted wooden floors and interior walls add to the building's sturdy and residential character. Photograph: Gilbert Cove and District Historical Society. The lighthouse after major restoration. As early as 1783 there was shipping and trade activity into Port Gilbert by the first Loyalist settlers, Col. Thomas Gilbert, his three sons and their families. The movement of mostly wood products is reported from the early 1800's into the early part of the 20th century. This commerce saw many small schooners, called coasters, most built locally, travelling up and down the bay and into Gilbert's Cove, Plympton, Barton and the head of the bay. "The Lighthouse was built in 1904, when the vessel captains running up the St. Mary's Bay greatly appreciate the light, which they say should have been erected at least twenty years ago." (quoted from report in The Digby Weekly Courier, August 26, 1904). The first keeper, William Joseph Melanson, born and raised in Gilbert's Cove, attended the light for nearly 50 years. In addition to the lighthouse that served as his family home, he had two wharves, an outhouse and a boat house (14 X 30 feet) with an oil room at the back to store the fuel for the light.. A small barn sheltered his animals near where he grew a vegetable garden. "Willie Jane", as he was called, with his wife and five children, had a self-built sailboat and rowboat. He rowed the latter regularly to the community wharf near the General Store and Post Office to purchase groceries. In later years, any one of his three adult children, Louise, Ivan or Joy walked out to the main road to do the errands and collect the mail. In 1950, when Willie was approaching age 75, the light keeper's job was officially turned over to his daughter Louise, who held the position until her death in 1972. The "Willie Jane" family was the only one to reside at the lighthouse and keep the light. The beacon was discontinued in May 1984. By the late 1970's vandalism was destroying the boarded-up lighthouse. Through the insight and determination of Ernie Morrisey and interested neighbours, the Gilbert Cove and District Historical Society was established in 1982. With provincial government agreement the property was leased to the Society indefinitely. With volunteer help and some grant money, the Gilbert's Cove Lighthouse was repaired and made suitable for a small museum, tearoom and gift shop in 1984. The grounds were cleaned up to provide a pleasant picnic area. In 1990, the Lighthouse was declared a Provincial Heritage Site. In 2003, thanks to grants from the NSLPS J.M. Kaplan Fund and government, the lighthouse was further repaired and armour stone added to the property to halt erosion. The tower was repaired and a red electric light now shines there, as a reminder of the original lighting mechanism. Visitors are free to tour the lighthouse which houses archival displays, an active quilting room, local crafts and a tearoom. There is also a craft shop. The picnic grounds and surrounding shore are freely accessible, with bird nesting marshlands in the area. Community events are held at the lighthouse during the summer. The Annual Lighthouse Family Picnic is held the 3rd Sunday in July. For details, see Events - Trips and Programs in July. Between Yarmouth and Digby on St. Mary's Bay, just off Highway 101(Route 1), situated on the end of the Lighthouse Road, overlooking Gilbert's Cove, Plympton, Duck Pond and Digby Neck. The lighthouse can be seen from the main road. Tower Height: 036ft feet high. Light Height: 040ft feet above water level.